Even a well acclimated Ornate Wood Turtle can be quite shy when first approached, but it will quickly peek back out looking for a snack! The Ornate Wood Turtle, is one of the most common wood turtles seen in the pet trade. They have been imported in large numbers in recent years. They can be quite beautiful and brightly colored, especially those from northern Costa Rica. These specimens will be covered with swirls of orange and yellow along with black ocelli (eyespots). Due to their variety of form along with beautiful colors and patterning, these and all the wood turtles are likely candidates for captive breeding programs. The Central American Wood Turtles are an appealing group of turtles. They are great to keep and will soon become tame. They are a manageable size for most keepers and have proven to be extremely hardy once established. Wanderers on land and somewhat shy, they should be offered plenty of shelter in the form of cork bark tubes or piles of dry leaves. They will often race under a shelter at the approach of their keeper, then will cautiously reappear to see if any food has been offered. Distribution: The Ornate Wood Turtle R. p. manni, ar Central American Wood Turtle, is found from Southern Nicaragua to northern Costa Rica. This turtle is one of the four subspecies of Painted Wood Turtles Rhinoclemmys pulcherrima which were described by Gray in 1855. With large numbers having been imported in recent years, the Ornate Wood Turtle is the most common of the Rhinoclemmys species seen in the pet trade. Status These turtles are not listed on the IUCN Red List. Description: The Ornate Wood Turtle is quite variable in color. Those from southern Nicaragua can be quite bland while those from northern Costa Rica are brightly colored. Some of the beautiful specimens are covered with swirls of orange and yellow with varying degrees of black ocelli (eyespots) on the carapace and with a wash of pink or red on the plastron. The adult Ornate Wood Turtle grows to 8" (20 cm) in length while some of the other species get bigger, reaching up to 14" (35 cm) in the larger Black Wood Turtle, R. funerea. Species such as the Ornate Wood Turtle will eat earthworms, redworms, crickets, and even mice. Once or twice a week these turtles also eagerly consume a salad consisting of chopped and shredded fruits and vegetables. They are especially fond of kale, zucchini, squash, mango, cantaloupe, banana, and apple. Dust this salad liberally on every third or fourth feeding with a high-quality calcium and multivitamin powder mixture. The Ornate Wood Turtle is semi-terrestrial. An enclosure for wood turtles closely mirrors a slightly drier version of an enclosure for marshy pond turtles, such as those of the Clemmys genera. A small breeding group of wood turtles, two males and four females, can be properly maintained in an 8' x 8' area outside or in a medium to large tub or stock tank inside. Substrate in indoor enclosures consists of a three layer system: a layer of pea gravel followed by a 10-12" layer of ½ dampened sand and ½ peat moss, followed by a thin layer of cypress mulch. For the more terrestrial wood turtles, such as the Ornate Wood Turtle, provide a cat litter pan, paint tray, or cement mixing tub of fresh water. Change the water every few days or when needed. Include sheets of bark and piles of hay or leaves to add secure hiding places on land. Provide UVB-emitting bulbs placed in shop light fixtures overhead and a 100-watt bulb in a clamp-type fixture over each basking spot. Breeding: Some wood turtle species including the Ornate Wood Turtle R. p. manni and Black Wood Turtle R. funerea have proven easy to breed. Literature suggests that most of the other Rhinoclemmys should also be fairly easy to breed in captivity. Most wood turtles will require a period of hibernation in the mild 60° to 65° F (16° to 18°C) range to inspire courtship and mating. Successful breeders cool their adults in a monitored indoor situation for between 45 to 60 days during the cooler months. Rain, both natural and man-made, is an important trigger for courtship and breeding in these humidity-loving species. The Ornate Wood Turtle has proven to be quite prolific in captivity, laying 2-3 clutches of four eggs each year. The babies can be set up in a 20-gallon aquarium with damp peat moss and sand as a substrate and with a layer of damp sphagnum moss, leaf litter, and cypress mulch on top. You can offer warmth from below with a heating pad on the low setting and from above with a 60-watt incandescent bulb in a clamp-type fixture. UVB-emitting bulbs are placed in an aquarium fixture or a shop light fixture above the enclosure. The babies are hardy and grow quickly when offered a healthy diet featuring a variety of feeder insects such as redworms, mealworms, crickets, and waxworms, along with fruit and soaked commercial pellets offered soaked in a flat dish or tossed into the aquatic portion of the enclosure. 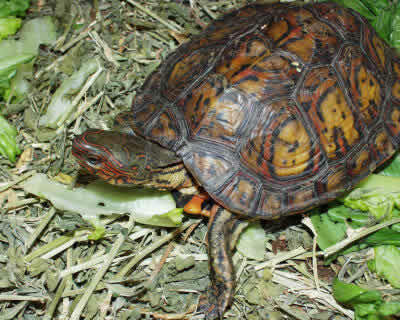 Ailments / Health Problems: Since most Ornate Wood Turtles, as well as the other Rhinoclemmys species have only been available as imported specimens, you can expect them to be harboring any number of parasites, especially roundworms. They have proven easy to "clean up" with Panacur® and Flagyl®. The resulting parasite-free turtles quickly put on weight and once acclimated well, tend to become quite sociable, even taking their favorite food (bananas) out of their keeper's fingers. Availability: Ornate Wood Turtles are commonly imported and there are also captive bred specimens occasionally available. Captive bred make the best pets and are less prone to harboring parasites. These turtles can be purchased from better pet stores, from breeders at the larger reptile shows across the country, and on-line. My wood turtle Barley is in a 84 gallon tank.. I am a person who is going to get an ornate wood turtle. I am going to put him in a 40 gallon tank is that fine. I also Want to know how much you feed your turtles protein And how If you feed them live animals or just pellets and witch is cheaper. And should I get a floating dock or something else. How much do your turtles weigh. Also do you guys have any problems with sunlight, or heat. Thank you guys soooooooooo much for helping me if you anwser my questions. My 3' Costa Rican ornate wood turtle was just upgraded to a 60 gallon tank. I have everything in place except what would be used for his 'shell-ter'. It's just substrate, bowl to wade, basking area, food area etc. He's been in his bowl two days? He had a fake tree and leaves henwould burrow under. Should I just stick with leaves? Is this why he's not getting out of his bowl? You might try mounting a heat lamp to create a warmer basking area. Lamps and bulbs for reptiles are available at pet stores, and you can add a thermometer near the area to monitor the heat. Also add calcium supplements to the food along with a UV bulb for generally lighting. That way the calcium won't just be consumed, but will be absorbed.